This study has 6 sessions, incorporating an introductory session and 5 lessons. The Study Set includes the Study Guide by Catherine Upchurch and a commentary, Parables of the Kingdom, Jesus and the Use of Parables in the Synoptic Tradition, by Mary Ann Getty-Sullivan (Liturgical Press). 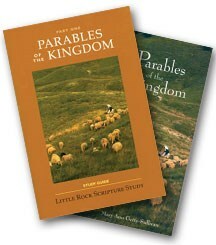 The same commentary is used for Parables of the Kingdom–Part Two, consequently, those planning to do both studies should order Study Sets for one of the studies, and order only the study guide for the subsequent study. Some of the most memorable teachings of Jesus were delivered as parables and are found in the Gospels of Matthew, Mark, and Luke (the Synoptic Gospels). Lesson One begins with acquainting participants with the important characteristics of a parable, and how they use images familiar to the audience and draw on common experience that nevertheless challenge the audience to see things in a new way. Subsequent lessons look at the parables found in Mark's Gospel, where the disciples are a privileged audience to Jesus' private explanations of the parables. Lessons four and five explore the ways Matthew uses the same parables but gives them a slightly different twist.